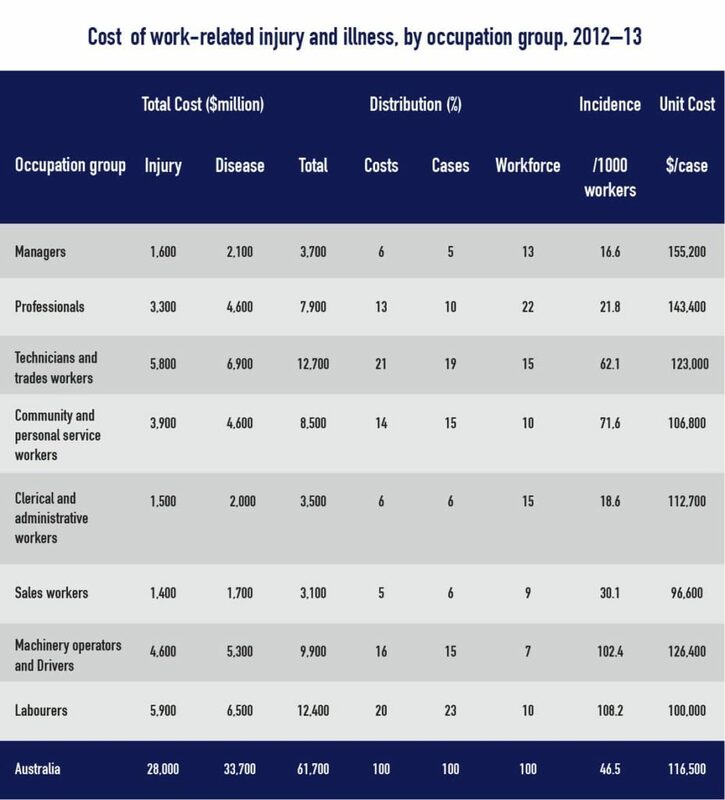 Workplace injuries have great impact on society in a social, interpersonal, organisational and economical level. Most employees who are injured at work require support and treatment from the community. For example, workplace rehabilitation services may be required for the injured person. After sustaining (or witnessing) a workplace injury, mental health issues like depression, anxiety, loss of confidence or even Post Traumatic Stress Disorder can also occur, and this can require great support from community counselling services. 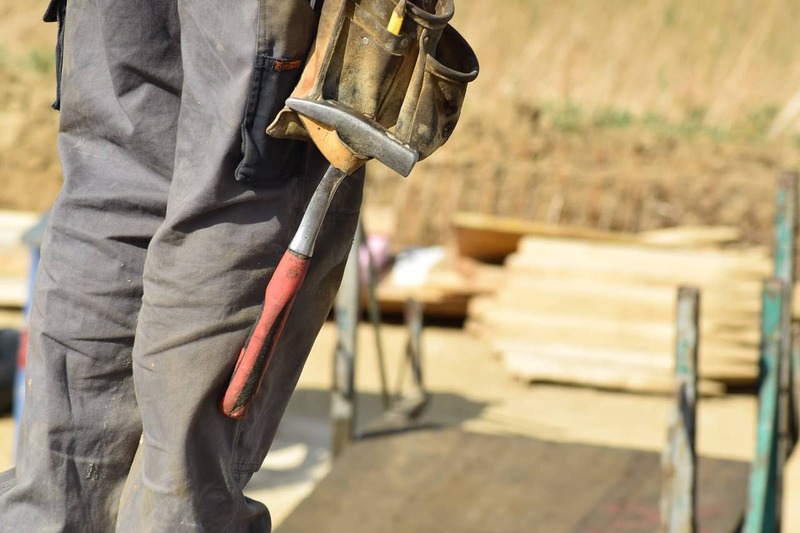 A severe workplace injury can permanently alter the quality of life of the injured person as well as their family, friends and coworkers – the toll these injuries can have on the community should not be ignored. 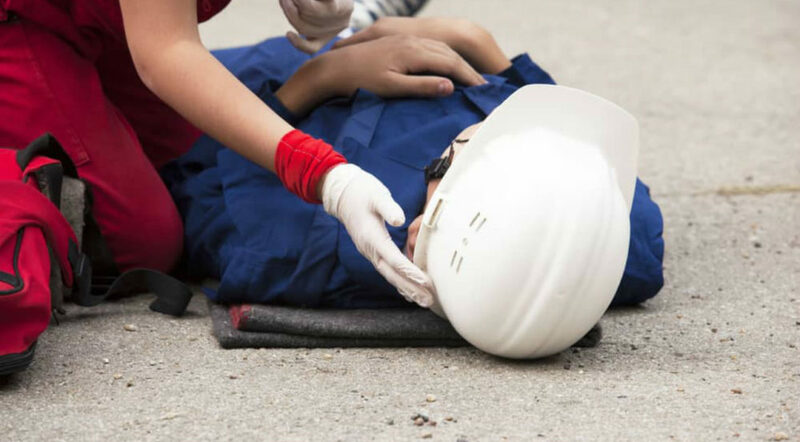 When an employee is injured, it is quite likely that they will be out of work for a period of time (this can be hours, days, months or even years). This time off costs companies through sick pay obligations and lost productivity. If the worker is unable to return to work, the company will need to find a replacement which incurs costs through advertising, recruiting and training. Other organisational costs can include repairing equipment, alterations to the workplace (to prevent future accidents), increased insurance premiums and loss of business due to damaged reputation. 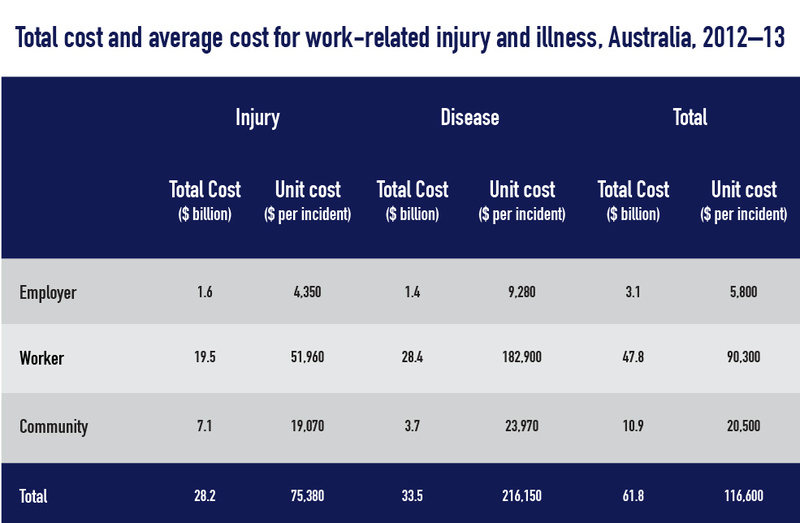 Between 2012 and 2013, work-related injury and disease cost the Australian economy $61.8 billion, representing 4.1% of GDP. 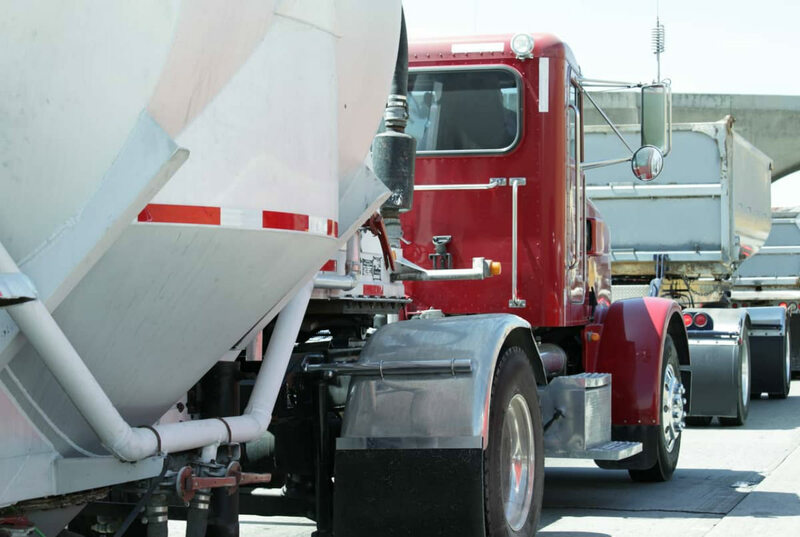 Direct costs include workers’ compensation premiums paid by employers or payments made to injured or incapacitated workers from workers’ compensation jurisdictions. 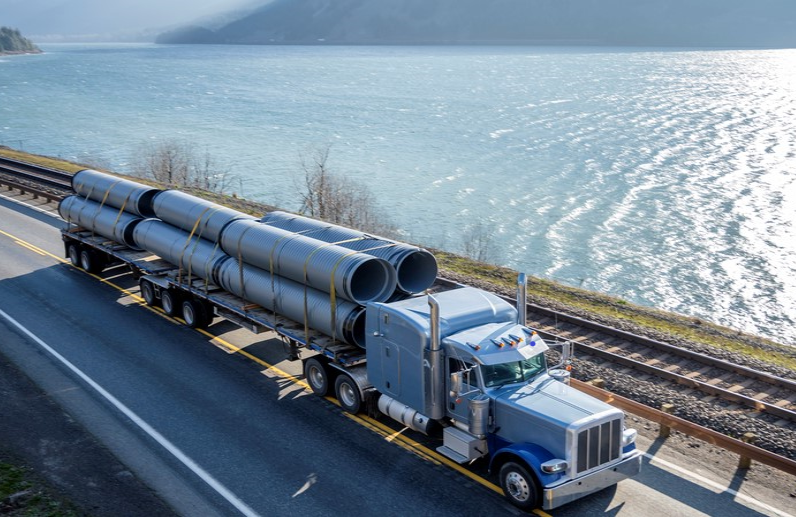 While measures of direct costs are understood and relatively simple to measure, these costs only cover a small percentage of the total cost of work-related injury and illness. Indirect costs include items like lost productivity, loss of current and future earnings, lost potential output and the cost of providing social welfare programs for injured or incapacitated workers. 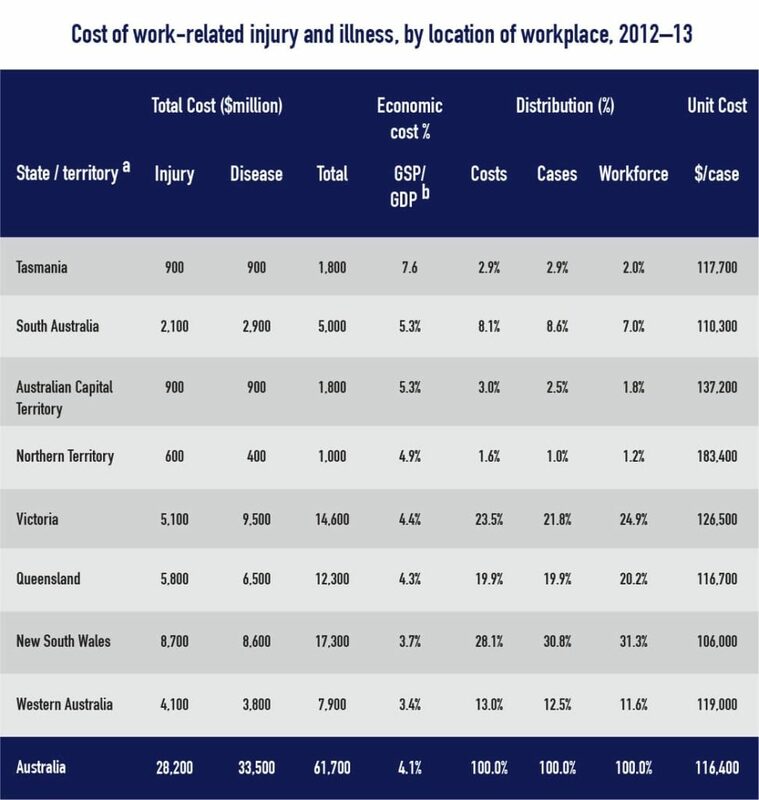 Safe Work Australia report The Cost of Work-related Injury and Illness for Australian Employers, Workers and the Community: 2012–13 provides estimates of the cost of work-related injury and disease to the Australian economy. The underlying message of these graphs is very clear: Workplace health and safety incidents affect all of us, even if we’re fortunate enough to get through our careers without actually sustaining a work-related injury or illness.